The proposal was submitted to the NASA Institute for Advanced Concepts ("NIAC") with the title "Antimatter Driven Sail for Deep Space Missions" (For anyone interested in applying for a grant, note that NIAC was shut down in 2007 and subsequently resurrected in 2011 as the NASA Innovative Advanced Concepts program). In the proposal we asked for $124,980 to fund 12 months of work. While Phase I of this research funded the basic science behind an antimatter-driven sail, Phase II was granted by NIAC to experimentally investigate one of the open issues that was raised. Unfortunately, due to the abbreviated funding from NIAC, this investigation was never completed. The remainder of this section is a review of the progress that was achieved. When a pulse of antiprotons annihilates against a small section of uranium foil, the foil picks up the momentum from the fission daughters. Because the antiproton intensities presently available from Fermilab are too small to cause foil velocities large enough to produce a measurable elevation jump, some sort of pendulum geometry is required. A highly sensitive geometry is a torsion balance (shown in the sketch and picture below), in which foil velocity is translated into amplitude of an angular oscillation. Assuming a pulse of 109 antiprotons on target, the following parameters and values have been translated into a design that is presently under construction. These values only account for the fission daughter momenta, and does not include any amplification mechanisms that are discussed elsewhere. Below is a table containing the parameters of this torsion balence. Note that the oscillation period of the torsion balance is approximately 10 minutes. In order measure the angular position of the balance over many periods, the effects of air friction must be avoided. Hence, the entire torsion balance is housed within a vacuum chamber. A sketch and a picture of the vacuum chamber around the torsion balance can be found below. The 1 meter wire is temperature stabilized in order to keep the equilibrium position of the uranium foil perpendicular to the antiproton beam direction. The Fermi National Accelerator Laboratory or "Fermilab" is owned by the United States Department of Energy and is dedicated to the study of High Energy Particle Physics. The production of antiprotons at Fermilab is described elsewhere on this website. The only feasible option for accessing Fermilab antiprotons on the time and financial scale of this Phase II award is to construct a robot that can carry the torsion balance to a convenient extraction point in an existing beam line. 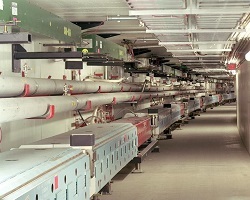 The picture to the left shows the Fermilab Main Injector tunnel, with the Main Injector magnet string (light blue and red magnets) in the lower left, the Recycler antiproton storage ring (rainforest green and gold magnets) in the upper left (design, fabrication, and installation leadership by AntimatterDrive co-researcher Dr. Gerald Jackson), and the tunnel aisle that will be traversed by the robot. At its minimum, this aisle is 5 feet wide. Antiproton extraction is performed using the existing proton injection kicker and Lambertson magnets. Modifications to the kicker trigger and timing systems have already been arranged. These systems will extract the antiprotons out of the Main Injector up the proton injection transfer line. It is necessary to build and install a magnet system to steer the antiproton beam out of the proton injection transfer line into a separate optical system that aims the beam toward the torsion balance. The magnet system is sketched below. The leftmost element is a switch magnet that steers the antiprotons downward out of the proton transfer line. An enlarged vacuum chamber allows the antiprotons to leave the proton transfer line vacuum chamber at an angle close to the normal of the stainless steel chamber wall. From this point on the antiprotons propagate through air.